The State Central Library, Goa, occupies a place of pride among the oldest public libraries of India. It was started during the Portuguese regime, in 1832, and was known as Publica Livraria. 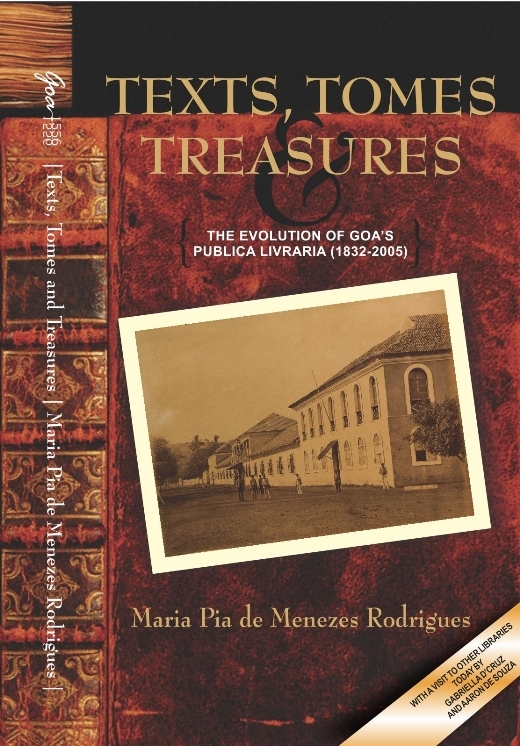 In 1836, the name of the library was changed to Bibliotheca Publica de Nova Goa. After Liberation, various changes were introduced and the library services were expanded. The Biblioteca Nacional de Goa was renamed as the Central Library, and in 2012 its name was changed to the Krishnadas Shama State Central Library. Today, it has plush new premises at Pato, at the entrance to the Goan state capital. This book by a one-time head of the institution is a detailed attempted to trace its history and chart out the challenges that lie ahead. Includes a 16 page photo-essay on libraries in Goa today, by Gabriella D’Cruz. Rapid and very exciting developments in information and communication technologies in the 21st century make it necessary that public libraries have to change the way in which information is collected, displayed and accessed. They need to play an important role in eliminating the digital divide, created due to the gap between the information rich and information poor. Library authorities in Goa had several plans to improve the library services, which could not materialise due to various shortcomings like those of space constraints, shortage of staff, lack of finance. But, at the end of the first decade of new millennium, marked the beginning of several developments in these sectors. Changes have been effected in recent times. Carlos Fernandes, promoted for the post of Curator on a regular basis, took the charge of the post on December 15, 2006, from Fatima Braganza, Senior Librarian, who was officiating as Curator. The libraries which were under the administrative control of the Directorate of Education were transferred and placed under the Directorate of Art and Culture. Several posts were then created and filled. The total number of professional, ministerial and non-ministerial staff was 182 for all public libraries under the control of the State Central Library. The budgetary allocation for State Central Library for the year 2011-2012 was Rs 7,17,71,000. Goa should be proud to have a very modern building for its State Central Library, the foundation stone for which was laid down in 2006, by the then Chief Minister Pratapsing Rane. After holding an architectural completion, noted Goan architect Gerard da Cunha (who, incidentally, also happens to be a book publisher himself) was awarded the work of designing the building, All the work related to the construction of building was carried out through the GSIDC (Goa State Infrastructure Development Corporation). It is a six-storey spacious building with all amenities and necessary infrastructure. The library was shifted to new building in 2011. It was formally inaugurated by Chief Minister Manohar Parrikar on April 23, 2012. It is an state of art library, now named the Krishnadas Shama Goa State Central Library, in recognition to the contribution of this great personality to local literature as early as in the sixteenth century. New services have been planned as envisaged by national and international bodies, and provisions have been made to provide all kind of knowledge and information readily to its users. The library strives to provide resources and services in a variety of media to meet the needs of individuals and groups for education, information and personal development including recreation and leisure, as envisaged by UNESCO. All the activities related to registration of new members, and also the issue and return of books, are carried out from the first floor. Besides, around thirty local and national newspapers and over 250 periodicals on socio-political, educational, economic, scientific and technical topics as well as magazines on sports, films, cultural and literary aspects, are displayed for being read by the public, so as to keep them aware of current developments in various fields. On this floor, a provision has also been made for the visually challenged with a Braille collection and specially designed collection of non-book material. The second floor of the building has been designed for children. It caters to the needs of the young ones, right from toddlers to those 12 years old, with specially designed furniture and interiors. In addition to children’s books and reference sources it has a good collection of maps, globes and other audio-visual material, including toys. Children are also offered access to computers and the Internet. The main Internet browsing centre is also on this floor, and the same can be accessed by members of public on the payment of the nominal hourly charges fixed by the library. The library has access to a number of databases such as UGC InfoNet Digital Library Consortium, DELNET (Developing Library Network), CMIE (Centre for Monitoring Indian Economy Pvt. Ltd), EBSCOhost databases, IndiaStat and the JSTOR digital library of academic journals, books, and primary sources. This floor also has a study room for students. The Circulation and Lending Section is housed on the third floor. It stocks a wide variety of books mainly in English, Marathi, Konkani and Hindi, on different subjects, which cater to the educational, cultural, informational and recreational needs of the users. Since a majority of the readers borro books for their leisure and recreational activity, the collection of fiction and biographies exceeds those on other subjects. Older copies of magazines and journals are also made available for home issue. On the fourth floor is the Rare Books and Local History SectionRare Books and Local History Section, with its rich heritage of Goan history and culture. These include: manuscripts and early imprints from Goa and the rest of India; books on Goa and Portugal and its relations with India; bound volumes of newspapers and periodicals from Goa; books received under Press and Registration of Books Act, 1867; books on Goa and by Goan authors. A provision has also been made on this floor for the conservation and preservations of books, with a fumigation chamber and preservation lab installed. An imaging centre also functions here for the scanning of rare and old documents and making them available in digital formats. The reference section is on the fifth floor of the library. Standard reference sources like general and subject encyclopedias and dictionaries, yearbooks, almanacs, biographical, bibliographical, statistical and geographical reference sources, books for various competitive examinations, and expensive books on various subjects are found on this section. Access to educational video records is also provided in this section. Books on a range of subjects written in the Latin languages like Portuguese, French and Latin — in addition to some English works, all acquired prior to Liberation, are maintained on the sixth floor. This is an unique library in India having bibliographical rarities in Latin, Portuguese and French. From my recent visits to State Central as a library user, and from the information given above, I find that Ranganathan’sRanganathan, Dr S R Fifth Law of Library Science — The Library is a Growing Organism — has really turned into reality in Goa. Keeping in view the documents issued by the national and international organisations, the collection should be enriched with community information; Central, State and local government information; local history resources; genealogical resources and other information of local interest. Public libraries in Goa should function as a well-coordinated network consisting of the State Central Library, district libraries, taluka libraries and village or panchayat libraries. It is hoped that this library will act as a knowledge centre for every member of the society, thus helping to bridge the information gap. The Krishnadas Shama Goa State Central Library can indeed be a model State library of India.